... 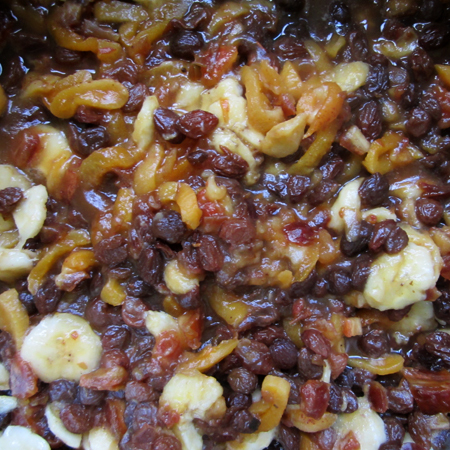 I was recently trolling through my little Book of Jams, Jellies and Chutneys (published by Harrod's) and came across a recipe for a date, raisin, apricot, and banana jam. Even I thought this one sounded weird. But I made it, and it is really, really good. I gave it to a few people. As they read the name of the jam aloud, they thanked me graciously with a skeptical tone in their voices. Since then, they have reported that they didn't think they would like it, but they did. Even Mark liked it! I followed the recipe to the letter... until I got to the sugar. After cramming multiple pounds of sweet fruits into my canning kettle, the idea of adding four - yes, four! - pounds of sugar seemed ludicrous. I cut it in half, still concerned that it was too much. As it turned out half the sugar was just right, although I think it might have set better with the full amount. Next time around - and there certainly will be a next time - I think I will purée the fruit with a stick blender to see how it is with a smoother consistency. Harrod's calls it a "tour de force" and says it would be good in a crêpe. I am not sure it rates "tour de force" but I do agree that it would make an incredible crêpe filling topped with a bit of crème Chantilly! I made a little faux Pop Tart with some leftover pie crust and filled it with this jam and it was very tasty! (Watch out, Kellogg's!) I can also say that it is lovely on toast (especially good when the toast is made with homemade bread), and combines nicely with goat cheese and crackers for an hors d’oeuvre. 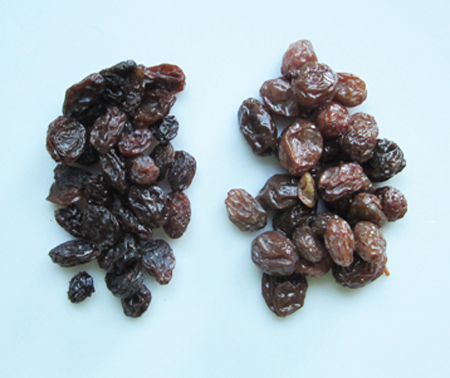 I end this post with a toast to the best dates on earth - soft, chewy and sweet dates from Yuma, Arizona. And, of course, to my friends Liney and Jon for their kind gift! Dates may be purchased online form the Bard Date Company. 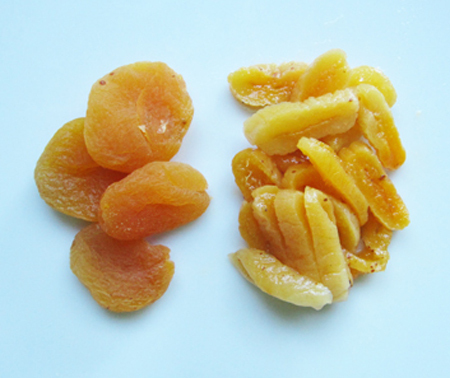 Soak the apricots and raisins in water to cover for 12 hours. 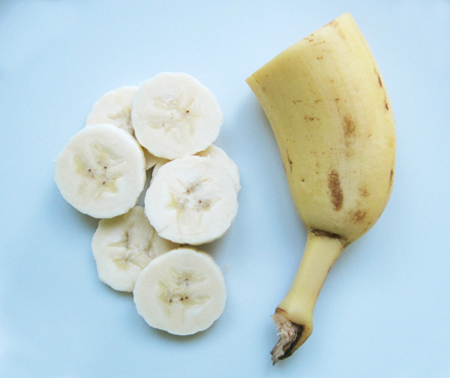 Pit and chop the dates, then add them and the bananas to the kettle. Bring to a boil, then reduce heat and simmer for 15 minutes. Add the sugar and stir, cooking over medium heat until sugar is dissolved. 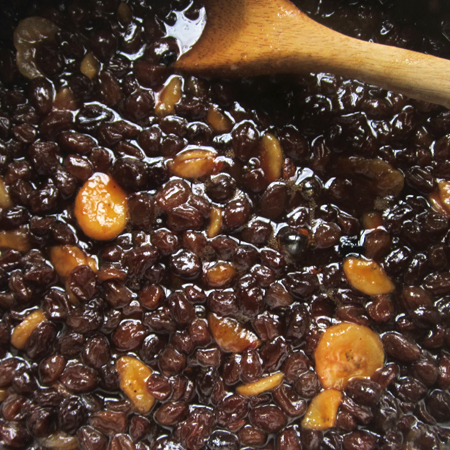 Bring to a boil and boil rapidly for 10-15 minutes, stirring occasionally with a long wooden spoon. To test whether or not the jam will set, put a saucer in the freezer. When you think the jam might be ready, put a small spoonful of it on the frozen plate. If it gels, the jam will set; if it doesn't gel, keep boiling! 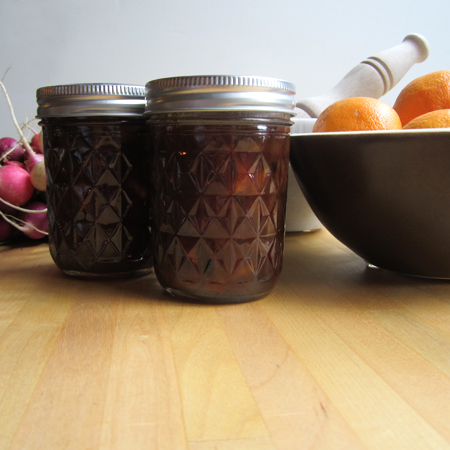 Pack the jam into 10 half-pint sterile jars, seal and process in a water bath for 10 minutes. This looks amazing David! 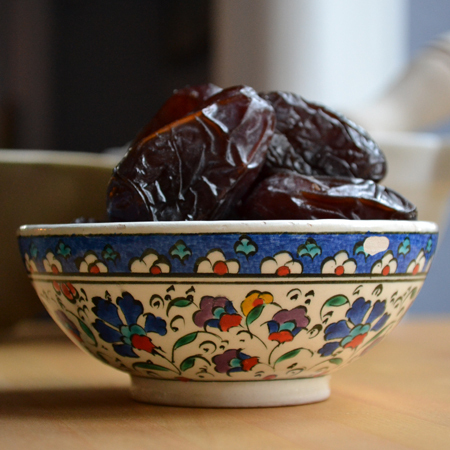 We grew up eating dates in many forms (middle easterners love dates! ), the most common way was stuffed with wet (water soaked) walnuts, but I personally love the jam!! Mmm David this looks and sounds delicious. I love dates but never used them in jam before. Thanks for a great idea and, actually, I can imagine this jam added to a tajine or a lamb stew for sweetness. What do you think? Would you add it to a savory dish? Ahu, I love dates so much. They are candy without the guilt, and go so well with so many things! I have never had the wet walnuts... how intriguing! I like stuffing them with a creamy blue cheese, too! Magda - adding these to a tagine would be perfect. My only savory use so far is with cheese and crackers. I bet it would be good for glazing a chicken, too! 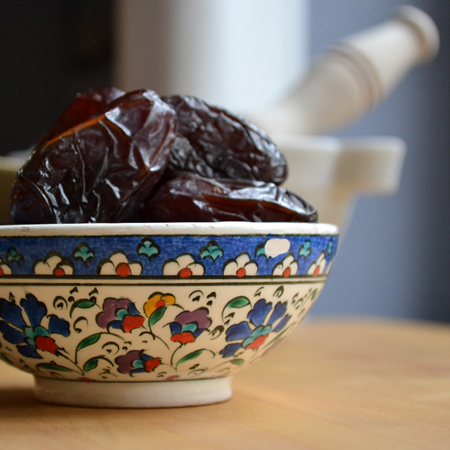 As it happens, I´m posting a salad with medjool dates tomorrow... What I would give for seven pounds of them; they are the most incredible dates of them all! And the jam does sound funny, but the ingredients I love them all, I wouldn´t complain one bit and would eat it with a spoon from the jar. Most of the times I find that jam recipes have too much sugar too. Though not all of them work if you cut it in half. Good decision David! I will pin this one and make it in the winter. 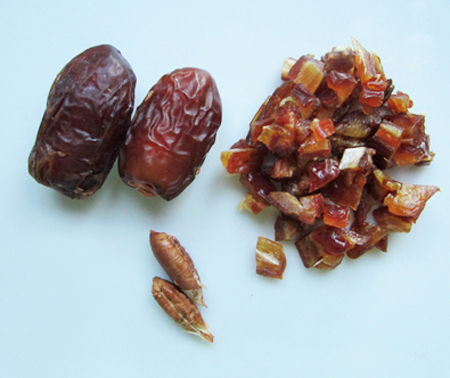 I wish I'd read this post a few weeks ago, when I had a big bag of dates that came with our veg box. I need to get better at jams & conserves that will last for a while in the cupboard... 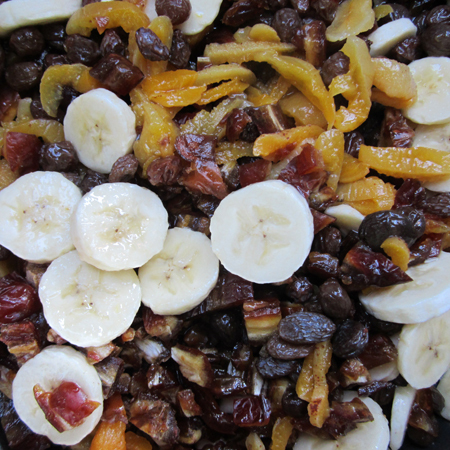 I always just end up baking with fruit and we get tired of it before we can finish eating. I wish I had 7 pounds of dates to make any number of goodies! This jam sounds like something I would love. It is jam packed (pun intended) with potassium, too! Thanks so much for taking a chance on what looks like a strange combo of ingredients! I could eat all this type of thing till the cows come home, so to speak. Delicious and so so good for you. Thanks, Susan! Loved the pun and it is so nice when something so tasty is good for you! Celia - thanks fro stopping by Cocoa & Lavender! I am already considering a second batch because I gave away too much of the first! What a cool-different idea. I love it! Always up for something different - that should be my motto, Colette! Wow! I would never have thought to combine these ingredients but after having read this - I would love to try it! Anna - it is definitely something for you to contemplate when it is winter Down Under!